Home » Other » Media kits for new bloggers who don’t have a huge readership….yet! 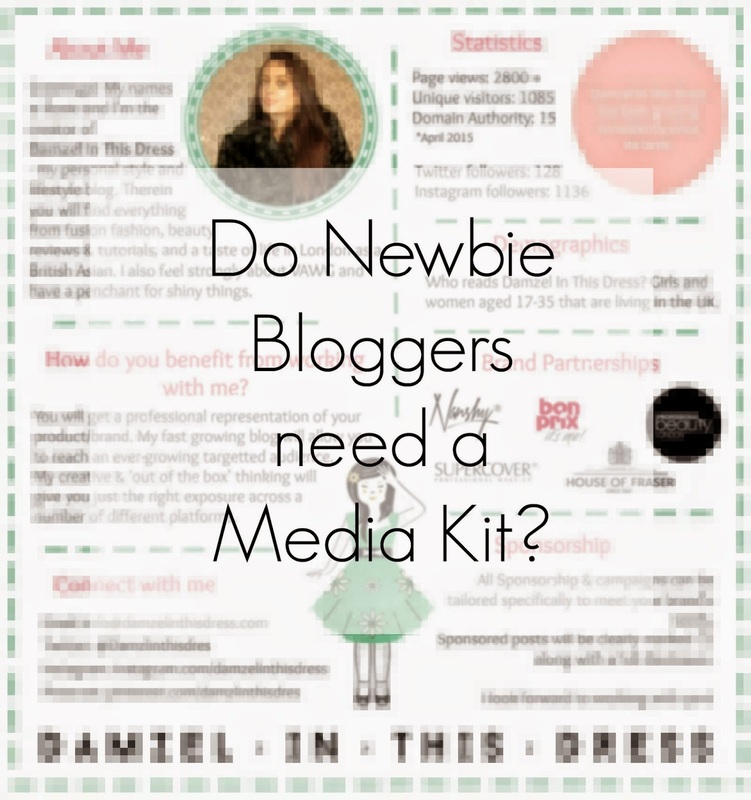 Media kits for new bloggers who don’t have a huge readership….yet! So it seems the new trend in the blogosphere is creating yourself a media kit. I’ll be honest, when I first read about it, I thought it was all a bit unnecessary and extra work for no reason unless you were a big time blogger. However since I’ve opened myself up to sponsored posts again I’ve realised it actually so much easier to have one handy and ready to send off. If like me, you’re fairly new to the blogging game, or you don’t have the biggest following, you might be thinking why on earth do I need one? Once I got over my irrational fear of trying something new, I realised that well actually, having a media kit ready shows professionalism. It also shows that you’re taking your blog seriously and keen for it to grow. Although numbers are important, there’s other things that can be highlighted on your media kit if your statistics aren’t very high (yet!). The best way to look at it is that this is your blogging CV. Did I just hear your inner voice scream ‘Oh god, please no’? In all honesty, it’s really not that bad to put together. Regardless of if you have had years of experience blogging or whether you’ve only just started out, there’s always something that could be highlighted because we all have strengths and goals. Here are my tips and ideas of what to focus on when your stats are not as high as you would like them to be. Figures: I’m not going to sit here and tell you that figures are not important because that’s not true but they’re not the be all and end all of a media kit. Featuring them on your media kit is a must but they don’t have to be so prominent. Try and share your figures for your social media account followers too. PR reps like to see how you engage across different platforms. Consistency: Consistency is key with everything. If you have a theme on your blog you might want to consider carrying it over to your media kit too. Once again it highlights a certain element of professionalism. About me: Sell yourself in a short paragraph here. Talk about you, your blog, perhaps why you started writing. One of my biggest pet peeves is people talking about themselves in third person, I wouldn’t do it on my own CV so why on a media kit? Writing in First person also allows your personality to shine through a little and for me personally, you might appear less narcissistic. Unlike an actual CV, it doesn’t have to be all serious. If you write humourously, you can reflect this in your media kit too. Clarity: Media kits allow bloggers to have clearly in writing any rules that they may have for their blogs. For example it is a good idea to explain that any sponsored posts will be marked clearly and contain a full disclosure. Why? well once again, professionalism but this also sets ground rules and prevents you having to have an awkward conversation if the brand asks you not to disclose something. Services: It may be that you offer a range of services to brands, for example Social Media management, guest posting, sponsored posts; this might not be clear straight away when someone checks your blog. Detailing what you can offer a brand, whatever that may be, could lead to amazing opportunities. Brands: Now if you’re a newbie to the blogging world and haven’t worked with too many brands don’t worry about putting ‘Brand partnerships’ on your media kit. Instead you might want to put “Brands featured on my blog”. Now this is absolutely fine to do but you have to be very clear that you’ve featured them yourself and it’s not an agreed sponsorship/campaign. Why do it? It could give PR reps an idea on what kind of brands you are looking to work with. This doesn’t mean add Chanel, Prada and YSL all to your brands you have featured. Be realistic and think about who your readers are. Demographics: Unless you’re a Google analytics wizard, it’s often very difficult to find out who reads your blog. Facebook fan analytics have made it easier and could help if you have a Facebook fan page. If not, you could try doing a survey. This is great to add to a media kit because not only does it show that you own your blog in all aspects, it allows PR reps to figure out quickly and effectively if you’re the right candidate to be working with. Design: You really don’t need anything complicated to make a media kit. I used PicMonkey, a free photo editing tool online to make mine. I wouldn’t say I’m the most creative person out there but I was pretty happy with my work. It took me just half a day to do too! Do you have any tips for new bloggers that want to create a media kit?